On Capitol Hill in 1917, Rev. Clarence True Wilson spotted a muddy, billboard-cluttered corner lot. Wilson, executive director of the Board of Prohibition, thought it was the perfect site for Methodism's social reform presence in Washington, D.C.
Construction began on Nov. 17, 1922. A five-story building, located at 100 Maryland Avenue, was completed in 1923 at a cost of $650,000 to house the Methodist Episcopal Church offices, especially the Board of Temperance, Prohibition and Public Morals. Money for the project was raised through individual and church gifts, some as small as 15 cents. 70% of the donations were from women. Wilson’s wife, Maude, served as financial officer, property manager and director of operations. She also drew the original plans, which were approved by the board and given to the architect for development. The United Methodist Building is the only non-government building on Capitol Hill. 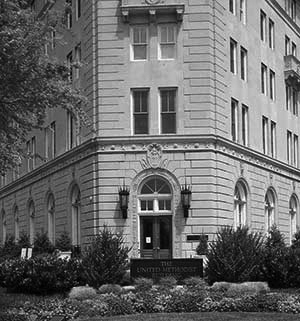 Designed in Italian Renaissance style and constructed of Indiana limestone, it was the first Protestant agency in Washington, D.C. In 1931, the board added on the 110 building. Money from renting its apartments expanded the social witness and action of the church. Its 55 apartments were rented in less than 30 days, despite the competition of the Great Depression. Soon after that, the 110 building became a financial burden, and it was only through generous friends of Wilson that the 110 side survived the Depression in Methodist hands. The building has played a significant role at volatile points in the nation's history, including the 1963 March on Washington led by Dr. Martin Luther King Jr., the 1968 Poor People's March, the farmworkers' boycott, years of protest against the Vietnam War, ERA marches, the 1978 Long Walk of Native Americans, the 1978 and 1979 Farmer’s Tractorcade, and the 1989 Housing NOW! March, and the 1996 Stand for Children March that included almost every bishop in the denomination. More recently, General Secretary Jim Winkler chaired a coalition opposing the Iraq war during President George W. Bush’s administration. The General Board of Church and Society was also heavily involved in a coalition supporting the Affordable Care Act. Special points of interest at this Heritage Landmark: Simpson Memorial Chapel - Named for Bishop Matthew Simpson, a close friend of President Abraham Lincoln, has served as a place of sanctuary and prayer on Capitol Hill. Within these walls, leaders from both parties and all faiths have found the strength and courage to act on their convictions. The Wilson Room - Named after founder Rev. Clarence True Wilson and his wife, Maude. The Americans with Disabilities Act was written here. Area attractions: The United Methodist Building is across the street from the Supreme Court and the Capitol Building. The Library of Congress, National Mall, and Smithsonian Museums are a short walk. Asbury United Methodist Church is a short metro ride away on the ride line, and was a stop on the underground railroad. Harriet Tubman hid runaway slaves there, on their way to the northern United States and later to Canada. Foundry United Methodist Church is a slightly longer metro ride away on the red line. President Abraham Lincoln became a Life Director of the Methodist Missionary Society, and President Rutherford Hayes attended Foundry nearly every Sunday during his term. President Franklin Roosevelt and Prime Minister Winston Churchill attended a special service at Foundry on December 25, 1941. President William Clinton, Secretary Hillary Clinton, and their family attended regularly. To visit: The United Methodist Building is open from 9:00-5:00 on weekdays. If you would like a tour, please call us at 202-488-5600 before you visit. Location: Located within the boundaries of the Baltimore-Washington Annual Conference, the buildings are located at 100 &110 Maryland Avenue NE, Washington, DC 20002. Food and Lodging: There are many food and hotel options in Washington, D.C. If you are visiting the United Methodist Building, you can eat at the Senate, the Supreme Court, Union Station, or at a restaurant along Pennsylvania Ave. There are plenty of hostel and hotel options in Washington, D.C. Hotels are more expensive during the Cherry Blossom festival and other busy times. Directions: There is no visitor parking, so please use public transit or walk. Take the red line to Union Station. Walk three blocks south, along First Street NE. The United Methodist building is at the corner of First St and Maryland Ave.
Take the blue/orange/gray line to Capitol South metro station. Walk three blocks north on First Street NE. The United Methodist Building is at the corner of First Street and Maryland Ave.
Take the blue line to the Capitol East stop, which is right in front of the United Methodist Building. The blue line starts at the Navy Yard Metro station and ends at Union Station. You can also take the yellow or red lines on the circulator to Union Station, and then walk three blocks north along First Street to the United Methodist Building, which is at First Street NE and Maryland Ave NE. To learn more about United Methodist church history in this area: Robert Shindle, Archivist, Lovely Lane Museum, 2200 St. Paul Street, Baltimore, MD 21218, 410-889-4458; Fax: 410-889-1501. Russell E. Richey, Early American Methodism (Bloomington: Indiana University Press, 1991).